The founder, Øivind Opdal is employed as a Simulation Specialist at Norske Skog Saugbrugs, and runs Opdal SimTech in the time not occupied by simulation activities at Norske Skog Saugbrugs. All blocks are now compiled in version 9.2. All dialogs have been cleaned up, many blocks have got a reduction in number of “tabs”. Sand, Air and Pressure are now included for most blocks. Review of almost all sourcecode. Many more blocks can now be stopped during simulation, providing more opportunities for applying an operational window so that the user can create operational scenarios for evaluation of dynamic mass balances. Where possible, similar blocks have been merged. Some blocks have got completely new icons, some have got additional views. 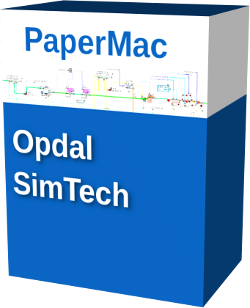 Pulp Mac AB and Opdal SimTech AS have now signed an cooperation agreement for modelling of the Kraft Pulp Process. FlowMac-blocks can be combined with the PulpMac-blocks for modelling of the Kraft Pulp Process. FlowMac is an excellent tool for identifying possible energy savings. Posted by Øivind Opdal on Nov 24, 2014 in Product updates | Comments Off on FlowMac is an excellent tool for identifying possible energy savings. FlowMac is an excellent tool for identifying possible savings in Thermal energy. With FlowMac the user can make a detailed model of the drying section of a paper machine. 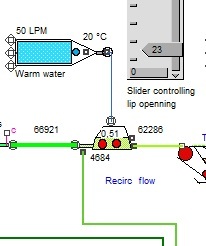 With the model the user then can simulate operational conditions in the drying section and optimize steam consumption. FlowMac comes with a detailed tutorial model of the drying section of a paper machine the user can use as a guide. FlowMac is based on ExtendSim a simulation software developed by Imagine That, Inc and runs on Mac’s or PC’s. FlowMac contains a series of libraries with in total more than 500 blocks as chests, pumps, valves, meters, head boxes, etc. Most of them designed for use in pulp and papermaking models, but other processes can also be modelled. There are more than 200 tutorial models in FlowMac to be used for training in use of the system, testing and understanding of important processes. Complete models for TMP and recycled fibre pulping lines, paper machines, boiler house and effluent treatment plants are included. The system is easy-to-use, modular with a graphical interface. Models are made by connecting process blocks into a flow sheet on the computer screen. The standard blocks in FlowMac should be sufficient for construction of a complete mill model, but customized blocks might be required. Customized blocks can be made according to customer specifications. FlowMac also comes with some blocks with open scripts, which serves as examples if the customer would like to create their own special blocks. With FlowMac the user can build quite accurate process models with simplified control system, and add more complex control functions in the positions needed, when needed. • Modelling of fractionation in screens. 9 different fractions! A large screen is an advantage, but not required. Filesize of the models are mostly dependent on how many iterations the models are set up to run, and how much data that have been stored in plotters inside the model. FlowMac can do both dynamic simulation and steady state simulation. In the library Chests.Lix there is dynamic storage tanks with an ideal mixing, plug flow storage towers and the different storage tanks can be combined to represent the actual process. When starting to build a new model in FlowMac, the user have to decide whether dynamic or steady state models are going to be made. Time lags in chests, pipes and paper machine sections are included. During a simulation, flows of water, fibre, fillers, pressure, air, steam, condensate and temperature and so far up to 60 tracers are transferred between blocks. Summaries of operation costs and energy consumption can also be included. 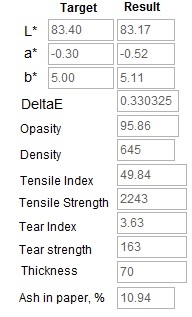 A simulation can be paused to modify process parameters for sensitivity analysis. Sliders allow continuous changes of important parameters, such as lip opening of the head box or first pass retention of fibres in the wire section. With FlowMac there is also other ways to control the simulation. For a paper machine, you can create a production plan and let this production govern the simulation. For other parts of a Mill you can create an operational pattern (Power Shedding, Planned Maintenance Shuts ++) and look at utilisation of buffers. • Text reports: Mass Balance summary, engineering data for Pipes, Pumps, tanks and other equipment. • Utilise the “Notebook” function in ExtendSim where the user can create a report containing exactly the wanted data. • Data can also be stored in a Database. FlowMac is continuously developed to fulfil customer requirements and a long term goal is to extend FlowMac to other process areas. For more information, a quotation or examples of use of FlowMac, contact Øivind Opdal. The latest version of FlowMac is version 6.12. – New sedimentation bassin, where it is possible to have different separation of fiber and filler/ash. – A new Heat Exchanger for heating air with hot water. – WW Supplier, Flow Input are blocks where it now is possible to feed time series in. FlowMac was used to make detailed mass balances for fiber, water, filler and energy. The model were tuned to have the same production rate, temperature profile and consistency profile as the real process. This paper machine have a pump, piping and control strategy for heating PM white water in the TMP heat recovery system. Several studies have shown that this heat stay in the white water tower. Actual temperature measurements show that the temperature in the white water tower can be 5°C hotter than the white water fed to the main pumps out of the tower. With the model, we simulated alternative ways to create more circulation of the white water in the white water storage tower. The simulations showed that all heat that could be fed to the main white water pumps would reduce the amount of fresh steam to the white water silo. The FlowMac simulations showed that a 350 mm pipe had to be diverted and extended 20m in order to get an annual cost savings of 300 000 EUR. FlowMac was used in a main study for a rebuild of an existing effluent treatment plan. With FlowMac we made a complete model of all different treatment stages: preflotation, buffers, presedimentation, anaerobic treatment, aerobic treatment, secondary sedimentation, tertiary flotation, sludge handling. It has been developed a new FlowMac block for anaerobic treatment where the user can specify COD-reduction and the COD is converted to raw biogas (methane, CO2 and H2S). Mill data for incoming COD, suspended solids and flow data can be fed into the model to evaluate overall COD reduction, biogas production and alternative operating scenarios. FlowMac gave us opportunities we would not have had with only a spreadsheet. FlowMac revealed some of the consequences of redesigning the effluent treatment plant.